Learning how to use spray guns is going to be a valuable skill for you if you plan to be a DIY homeowner. Even if you rent your home, you will find this valuable. This is because it will save you a lot of money along the line. When you compare the higher cost of calling in a professional for your home painting jobs, then you can see the gain. A traditional spray gun is called a siphon feed spray gun and they usually come with a cup that holds the paint. The paint stays in the cup and gets passed through the nozzle. But this kind of conventional spray gun is becoming less popular because it wastes a lot of paint. 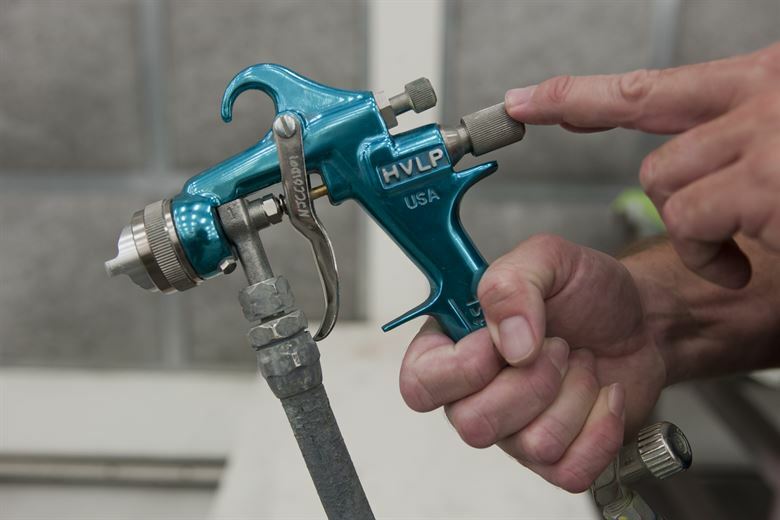 This is why manufacturers are now choosing to make another kind of spray gun a High Volume Low Pressure (HVLP). It’s a popular gun nowadays because there’s less overspray which means it’s environmentally friendly. There is usually less paint in the air and more paint on your project. On this kind of spray gun, you have several knobs to be mindful of. The first knob is called the horn. This knob controls how the stream of paint coming out of the sprayer is distributed: vertical or horizontal. When it comes to a paint spray gun, you have to think about the fluid that comes out of the nozzle. And the air that comes up through the tool to meet the liquid. This often creates a perfect mixture. Usually, you have to be accurate in your measurement. This will allow you to get the right amount of fluid and air for the final material to be smooth. Because without this, you won’t be able to create the finish or coating you are looking for. So, the right amount of paint in the right amount of air coming together is what’s technically called atomization. Think of this as being the perfect mixture of air and fluid that creates this mist that you spray with it. Technically, that’s what you basically see on the surface of your project. The second knob is called the fluid adjustment knob. It is there to control the amount of paint coming from the cup down through the nozzle. The gun usually comes with an air supply. This is where the air is produced to push the painting material out of the gun onto the surface. There is a knob that controls the air, called the air adjustment knob, which is attached to the gun itself. If you want, however, you can attach a regulator to the spray gun. That regulator will then control the airflow for you and you can see exactly how much air you are using. Most times, this kind of regulator is sold separately and you may have to purchase it separately. Once you have the right one for your gun, you can attach it to the gun using a plumber’s tape. After that, you need to attach the hose to the gun. You need a female plug – one that has threads inside that you can attach to your regulator. After attaching the plugs, they will tell you how much PSI you are using. Usually, the tools you purchased will indicate what to set your PSI too. So, all you have to do is to set your PSI by pulling the trigger on the gun. Once pulled, the trigger will allow air to come out of the spray gun which will allow you to set the PSI. After this is done, you are ready to start working on your project. Another very important thing you need to consider is something called Cubic Feet Per Minute (CFM). So, if you have a small compressor there’s just in a way that you can spray paint because of the air requirement. The other thing you want to ensure is that the spray gun’s CFM requirement is in line with your compressor. This should be done before you purchase a spray gun. Also, if you are buying both at the same time, you still need to pay attention to this. For example, you shouldn’t buy a gun with a requirement of 10 CFM if your compressor is only putting out 6 CFM. When spraying on your project, you should not be too close or not far from the surface. The project should be within six inches of you and if you have your protection on, you can start spraying. Paint Guns: How Much Air Is Required to Use a Paint Gun? After setting up your spray gun, think about how much pressure you are going to use. This will ease your job when you are working with a cup or a chop gun. You can adjust the pressure up or down from the gun. This depends on the viscosity/thickness of the material you are using and what you are going to be spraying. You don’t want a lot of fallout and bounce off too! You want your paint to stick to the surface of the project so you need to set your pressure accordingly. Your spray gun should have a gauge on it so you’ll know where you’re at and this stays constant. One thing is to try not to overwork the compressor by using a knob on it that will set the pressure down. And made sure the pressure going through the compressor is constant through the compressor. Some of the popular conventional spray guns require you to set the pressure on the compressor. This should be done according to the viscosity of the material you are going to put in it. To ensure the materials you are using hold up well, you don’t want to over thin them. And you don’t want to make them too thick because they’ll crack and break down. Before you get started spraying if you do not have a lot of experience, it is best to start on a large flat area like the side of a house or other area not easily seen. You can even just spray water for practice but make sure you let the surface dry completely before painting with real paint. In a good spray pattern, the paint or coating material is completely and evenly distributed onto the surface. There are several techniques that you can use to ensure a quality finish. Use some scraps of cardboard to test the quality of paint pattern. Start at the minimum spray pressure and slowly increase the pressure until a good spray pattern is achieved. If your pattern has what are known as fingers or tails that is uneven finish such as this, then the pressure should be increased. When you spray at the lowest pressure possible while still getting a good spray pattern will save wear and tear on your pump and spray tip. If you are at the maximum pressure setting and the spray pattern is still not suitable then a smaller spray tape hole size should be used or your material may need to be thinned. The spray gun should be held approximately twelve inches from the surface and aimed straight at the surface like this. Keep the gun a consistent distance from the surface. Move across the surface in order to keep the gun pointed straight at the surface. Fanning the gun to direct the spray at an angle causes an uneven finish. Flex your wrist at the beginning and end of each stroke to maintain an even coat. Don’t spray at an angle and keep the gun perpendicular to the surface to practice proper gun positioning. There are many projects you can do with paint spray guns so learning how to use one is going to help you a lot in your projects. After learning how to use them, you should also familiarize yourself with the kinds of jobs they can handle. Most guns are designated for handling small painting jobs so if you are a homeowner, you may find it useful to have one at home. They are great for texturing your walls, kitchen, bathroom, and ceiling and you can carry out popcorn ceiling, orange peel effect, and knockdown without any problems. Now that you have learned how to use spray guns, the next thing is to read reviews on the best spray guns and choose one that catches your fancy.